I'll be posting some pics of spring break stuff, but I thought I'd start with PEEPS!! If you haven't discovered the best way to eat a peep... let them air for a day (or two or three) and then blast them for 15 seconds in the microwave. AMAZING! dang, yo. 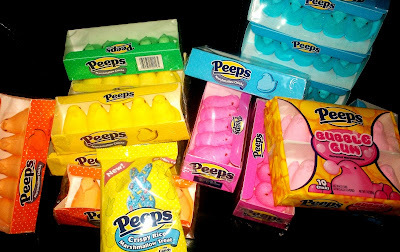 that's a lotta peeps! we have a 4 week spring break. just started today. i love it. great for recharging, house projects, lesson planning, and camping:) we're on a year round sched. 4 off in the winter, 4 off in the spring, and 6 in the summer (we go til july 20). Peeps are great! Love the peep blowing the bubble on the bubble gum package :) I have always wanted to do a peep observation drawing project after Easter! But I do not see any Hello Kitty Peeps.....the bunny brought those for Gretchen. And you know you can paint with them....just saying.